You show me yours and I'll show you mine. 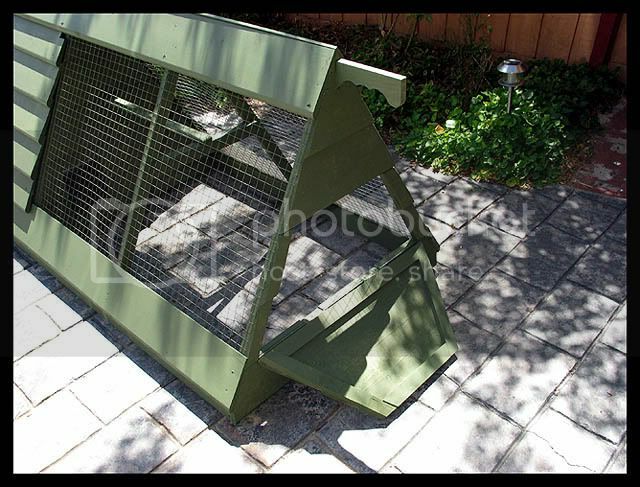 A chicken tractor is a movable (usually) floorless chicken coop for the purposes of pest control, lawn care, fertilization, and sheltering the chickens. Your chooks can be part of your sustainable program for the organic management of pests and diseases enabling reduced dependence on pesticides and nutritional supplements. A must for the tractor is it needs to be able to be moved easily by 1-2 people, having wheels can be helpful and make for a solo operation . This can be difficult if you live in a wet area though. Have a sheltered off end from the weather. A nice comfortable place to roost at night. A nestbox to lay those gorgeous bum nuts. ( bum nuts are aussie for EGGS) Food and water containers. These containers can be suspended from the roof of the tractor to allow for easier movement in the enclosure. They can be killers in hot weather, and need to be parked in a shady spot. 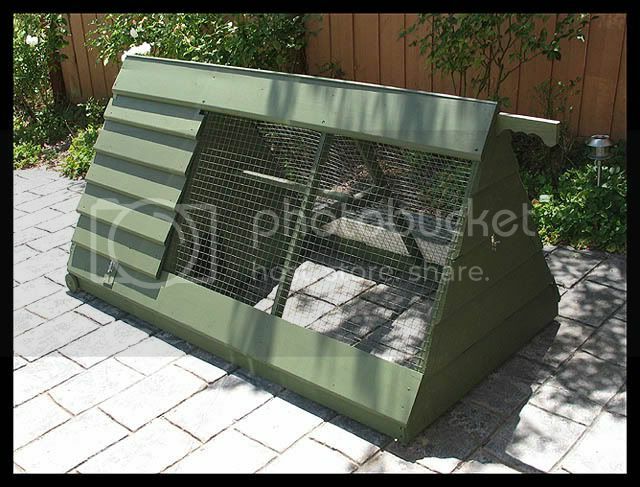 With a mesh floor, foxes cant dig in, and they will do less damage to lawn (can still get a green pick though). 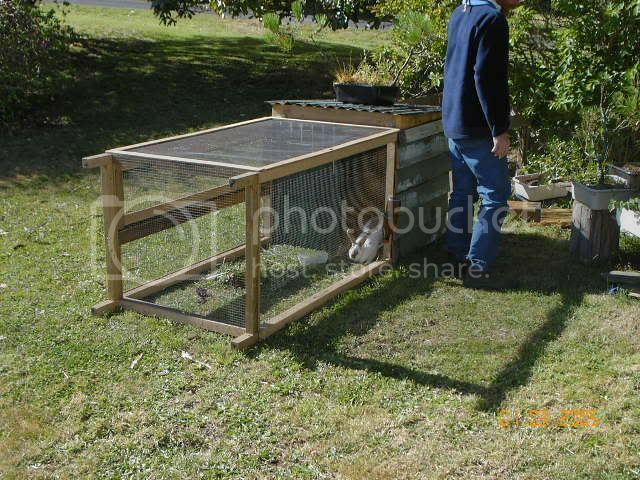 with no floor, they are great for vege-gardens in letting the chooks have a good scratch. Constantly moving them to fresh ground will help reduce problems with internal /external parasites building up in a chooks system. http://home.centurytel.net/thecitychicken/tractors.html is a rather large (not really dialup friendly) gallery page of tractors if you are interested. 1. I'd completely cover over 2/3 of the coop and leave 1/3 open (though still with only the 1/3 enclosed). This is because there have been issues of the food getting wet when it rains. 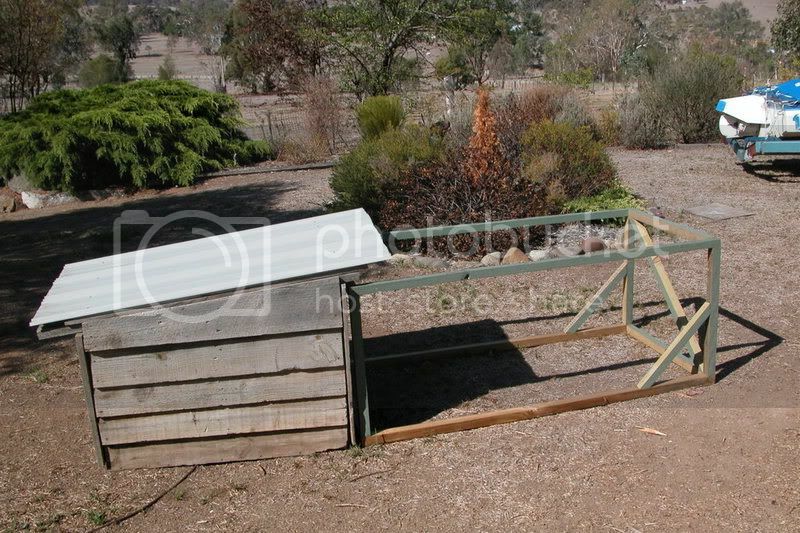 It would also allow the chooks to be out in the open part, yet still with some rain cover. I've now make a rain-proof feeder. 2. The small access hatch into the open area (at the front) is too small and makes it too hard to reach in and get the chooks (they love to get just out of arm's reach). Like the hatch into the roost area, I would make a whole 1/3 side as the opening. 3. Wheels are too thin and small for the soft grass/soil/lawn. Will be replacing with larger rubber 'billy-cart' wheels. Araucana, OEG Bantams, Wyandotte, RIR x New Hampshire, IsaBrown. Austrlorp x ?? Roo, 2x home grown hybrids of the previous! Last edited by AaronJ on Mon May 14, 2007 2:58 pm, edited 1 time in total. That's great AJ..it's suggestions like these that help people decide how they are going to make their own. You've pointed out some good points. Devoted Mum to my Australorp Bantam brood. I have heard that about the Linda Woodrow domes. I reckon if you had one of them you would use it as a day pen only when the weather is fantastic. The night pen being the warmer and cosier place. I'm all for the smaller pens with say 2 to 3 chooks per pen or for mum and babies. 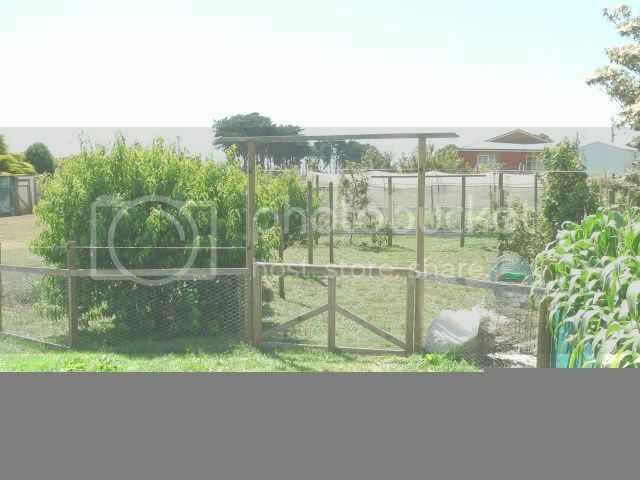 BUT I must admit that I have permanent chook pen gardens. My pens are 8metre by 2 metre wide. Covered in chook wire or some have white bird mesh, with a shed at each end. I have two that are like this and the third is covered with bird mesh as a day yard. The other two with the sheds have had chooks in for two years ( long story that one) but have now got the start of a lush vege garden in them.I will post pics in the morning when I get them sorted out. Here is a couple of pictures I found on my computer tonight. 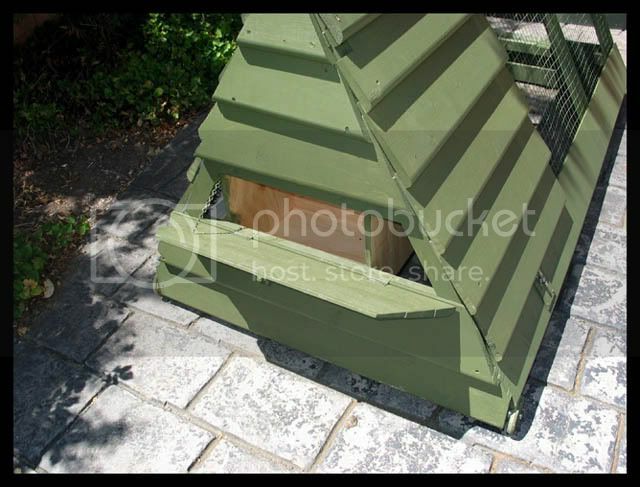 This above picture is the pen that used to be the rabbit hutch but is now for the Pekins as Milly the Rabbit died. The pekins have just cleaned up a garden for me. This cage is hopeless to move about as it's super heavy. The back boxed part is weatherboards and roofing iron. So you can imagine the weight in it. This is a distant view from my kitchen window up the back to my three fenced off permanent pens that are now being used as gardens. I will get better pictures tomorrow. The foreground is the orchard where the ducks roam in and the white mesh is the first of the three gardens. The rabbit is dead so not much point now. I doubt we'll get another one, don't want to risk it with all these chooks we have. Here's one of my chook tractors (before I wired up the run). 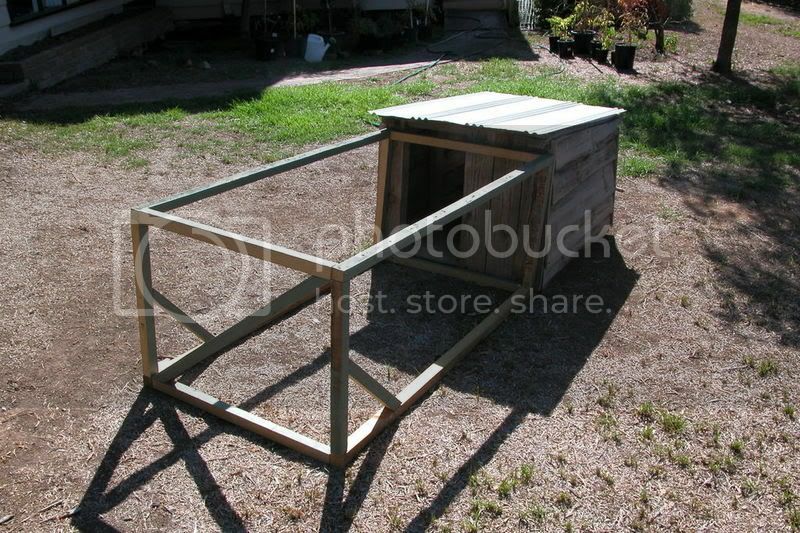 Its a large dog kennel that I fixed up. I put a sheet of polystyrene on top of the original wooden roof and a sheet of tin on top of that. Theres a door on the back of the kennel. There's another wooden frame (not in the picture) that forms the wire roof of the run. This is removable for easy access. Excellent ...Look very similar to my rabbit pen. Yeah mine are very heavy too, so I don't look forward to moving them around. BTW Darrssy, Is that corn you've got growing on the right? It looks very healthy! I don't have any veg this year... I planted fodder for the chooks and nothings grown, so I've given up until the rain starts again in October. In the meantime I'm concentrating on getting a grey water system set up so we can water the gardens. Yes that is Corn and that was last years crop but we had the same crop this year. different end of that garden. We have grey water going onto the orchard now. It's fantastic. I hope we can do the same, although we live in the inner suburbs so we don't have an orchard - I'm sure my chooks would love one. At the moment I've got a pipe throwing water on the lawn until I can organise the drip system on the veg beds. We have our fruit trees growing on Espalier. It leaves room for other things that way. Perfect for small suburban backyards.